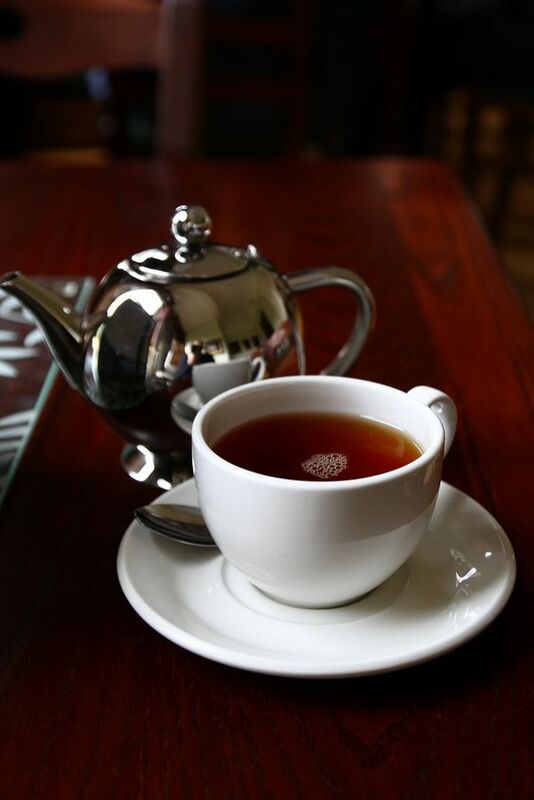 A lovely look at teas from all over the world. How is it grown? Where is it grown? 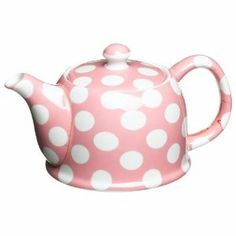 What is the best way to make tea and why each one is unique and takes a different preparation. I have to admit I have been a tea lover all of my life. 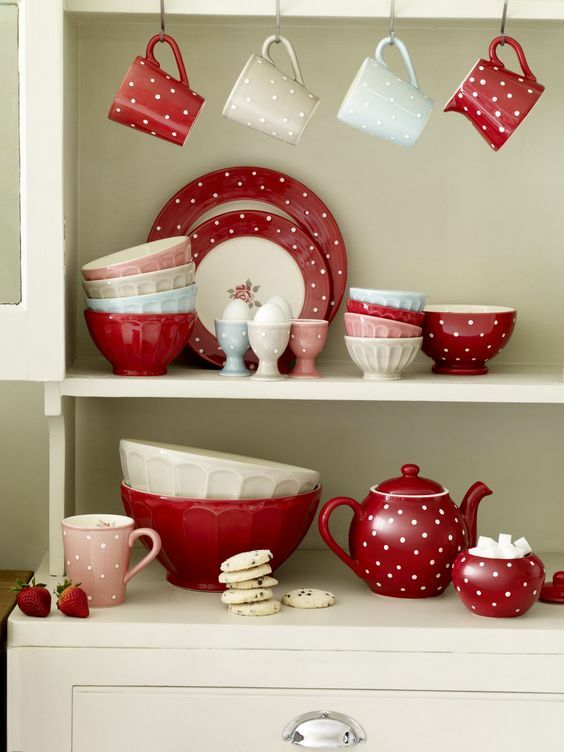 I dream of owning my own tea room and have collected many, many books on the subject of tea. 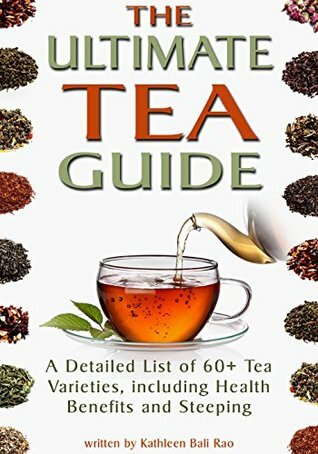 This is a really nice research book if you are just getting interested in teas of all types. I thoroughly enjoyed this book and plan on keeping it in my Tea Book Collection, because after all Tea is not simply a beverage, it is an experience. I am big lover of food trucks. Big Truck Tacos being my all time favorite. 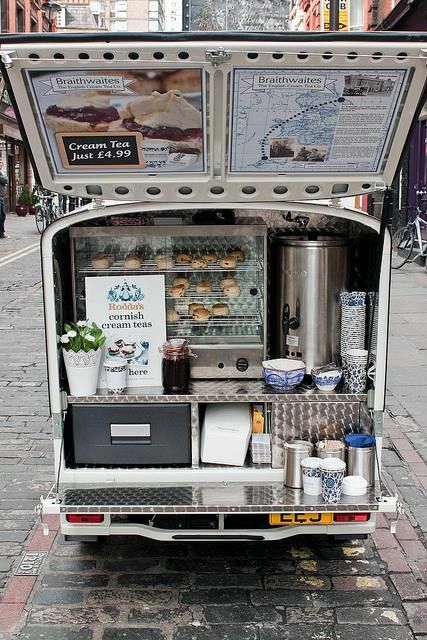 In doing some Tea research I came across Tea Trucks! I mean could life get any better? Well, yes it could. It would be nice if one of these was actually in the country I live in. But, alas, I must just look longingly at them, rather like that pair of Rene and Russo shoes that I want. 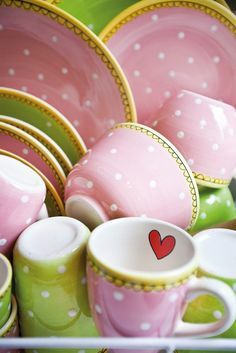 But I thought they were so adorable that I rounded up a few to share with my fellow lovers of Tea and all things decadently good! This is just the sweetest thing ever! I would sit on that stool all day! I guess I will have to move across the pond to get these! 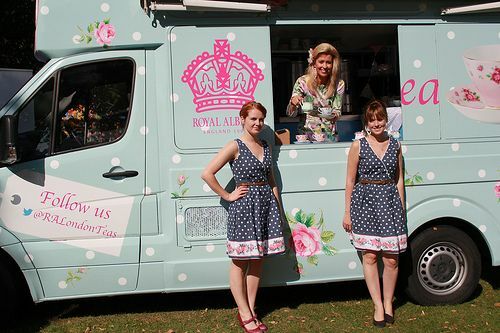 The lovely ladies of Royal Albert tea. 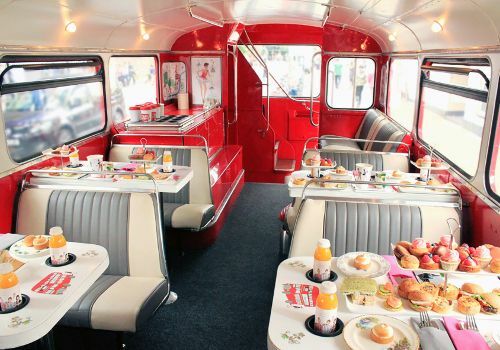 The Afternoon Tea Party Bus! Today we’re having a nice cup of Twinings English Breakfast Tea. Grab a cup! It’s been a bit since I wrote anything on here. I’ve been busy dealing with this lovely corneal ulcer that has left me blind in one eye. And since they will not let me put a contact in the good ( and I use that term very loosely) eye, I’m mainly walking around squinting with a patch on one eye. But that entire story is over on piratepatty.wordpress.com. So it’s been 4 weeks. I was getting to that self-pity stage which is a dangerous route to take. I was quoting Bible passages about Job and just getting on my own nerves. People were beginning to irritate the heck out of me for no reason whatsoever! Ah, but the Universe in all it’s wisdom had a plan. Here’s how that went. Thursday night OU Boy told me his left arm was hurting and had been for a few days. Now that boy has already had 2 major heart attacks, bypass surgery and several stints. That was 4 years ago when he was only 32. So Friday I received a call that he was on his way by ambulance from work to the Heart Hospital. Bam! Talk about putting things into Perspective! Here I had been whining about losing my eyesight in ONE eye and now the man I have loved for 13 years could be dying. After a long wait, a lovely nurse came and took me to a tiny office and told me to wait here,the doctor needs to speak with you. By now I am in full panic mode, as the last time I was taken to a small room the news was not good. Finally the good Doctor McGeary came in and laid it all out. OU Boy had had the famous Widowmaker heart attack and had been about 5 minutes from joining the Sooner team in heaven. He was straight forward in explaining everything and took me upstairs to see my love. Thankfully the surgery went extremely well and he is now home resting but feeling much better now that he has some blood flow to his heart. Yep, I’m going to marry that boy! 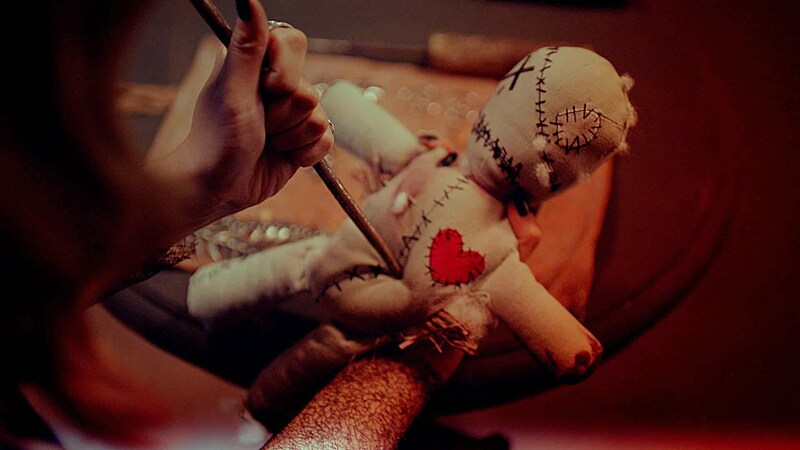 We have surely had our share of health issues lately, I am pretty sure that my crazy sister has a voo doo doll of some sort that she is stabbing regularly. Maybe once in awhile she could scratch my upper back for me. So thank all of you for your prayers, good thoughts, love and caring. We appreciate it more than I can say. Sometimes in the evening I really want something sweet. I’m like a 3 year old wanting a bed time snack, however eating at night is never a good idea for me. Not to mention the fact that I don’t eat sugar. Or dairy. Or meat or flour or anything except plants. And tea. So when my friends at The Herbal Patch recommended this tea, I thought why not. On the back the description reads: Discover a Treasure in Our Mayan Cocoa Spice. Embark on a journey to the ancient Mayan temples, where prized cocoa beans were ground and mixed with spices to create a sacred beverage that symbolized fertility and prosperity. We’ve taken this combination into the modern era by combining Organic cocoa shells, which supply antioxidants, with the traditional Ayurvedic warming and invigorating spices of Cardamom, Clove and Organic Cinnamon Bark. The individual bags are sealed really well but when I opened the little sachet, the smell of goodness hit my nose! I let it steep but 4 minutes and that was good for me. I noticed one of the ingredients was a small bit of Stevia leaf. I wasn’t sure how that would affect the flavor, but oh my goodness gracious, this was Good! I felt all of those lovely warming spices and could taste each one. The chocolate flavor was just right. Not too overpowering and not too subtle. It reminded me of my boyfriend’s favorite Mayan Chocolate Ice Cream from HD. I would definitely recommend it. It hit the spot with my sweet tooth and I slept like a baby! Welcome to our part of the country. 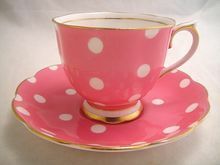 Inspirations Tea Room is located in Edmond, Oklahoma. 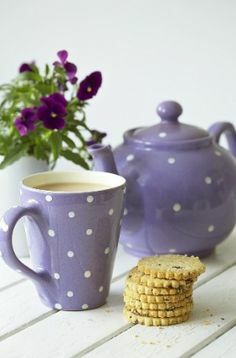 With their goal of encouraging Faith, Family and Friends, Inspirations offers a casual atmosphere that is just the place to meet up with friends, enjoy some great food and tea. 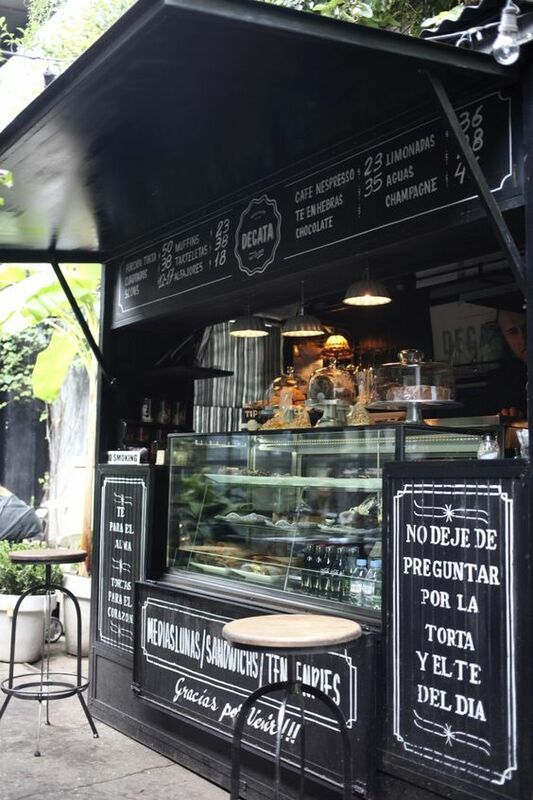 They also offer an extensive coffee bar. 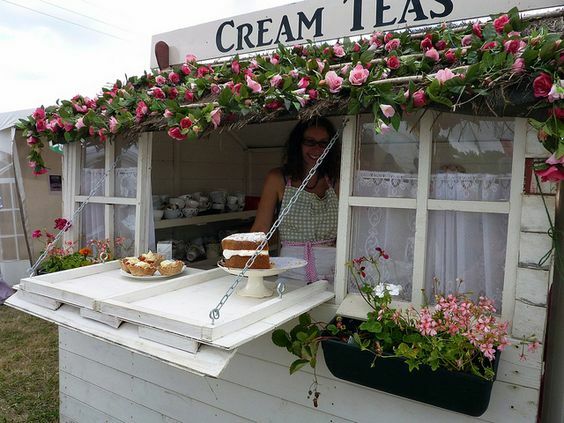 Or have a wonderful experience in the fine dining tearoom, enjoying the ultimate tea experience with tea trays and service. Shop in their exquisite gift shop, with over a hundred tea blends to choose from, Teaoli olive oils and balsamics, and lots more including jewelry and Tyler candles. I am the biggest fan of Tyler candles. And this place smells amazing! Hours are 8 a.m. to 4 p.m. and you don’t need a reservation. They also are able to host private parties in the Queen’s Salon. If you are in town, please stop by and say hello! We encourage all of our readers to support our local businesses. White tea can refer to some types of young and minimally processed leaves. There is very little agreement on what is and is not a white tea. Some say it is the minimal processing and some say it is just using the tea buds. Most definitions agree, however, that white tea is not rolled or oxidized, resulting in a flavour which is characterized as “lighter” than green or traditional black teas. It is harvested primarily in China, mostly in the Fujian province, but more recently it is produced in Eastern Nepal, Taiwan, Northern Thailand, Galle (Southern Sri Lanka) and India. The name “white tea” derives from the fine silvery-white hairs on the unopened buds of the tea plant, which gives the plant a whitish appearance. The beverage itself is not white or colourless but pale yellow and light to the taste. My favorite is the Silver Needle. As with all white teas, it is best prepared with water below boiling (at around 75 to 80 degrees Celsius or 167 to 176 degrees Fahrenheit) and produces a slightly viscous glittering pale yellow color with evidence of floating white hairs that reflect light. Baihao Yinzhen is said to smell of “fresh-cut hay”, and the flavour is described as sweet, vegetal, and delicate. 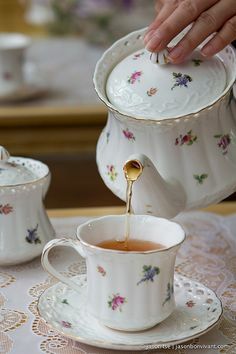 Steeping should be longer than other white teas; up to 5 minutes per brew, and the volume of tea to be used can be higher. There are few parallels to be drawn as the taste is not similar to any other teas but Bai Mu Dan, except the latter is fuller but not as sweet and delicate. In the Summer they are especially nice and light. Try one of the many varieties out there and let us know which is your favorite! Since I am still doing the one-eyed Pirate thing, I’m not delving into actual tea today, but rather I’m going to share with you some of my favorite pots and cups. 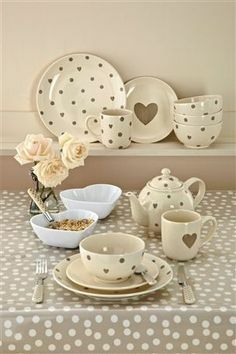 Maybe because it is Summer, or maybe just because I’m a bit off, but polka dots have taken over my world lately and I love them! 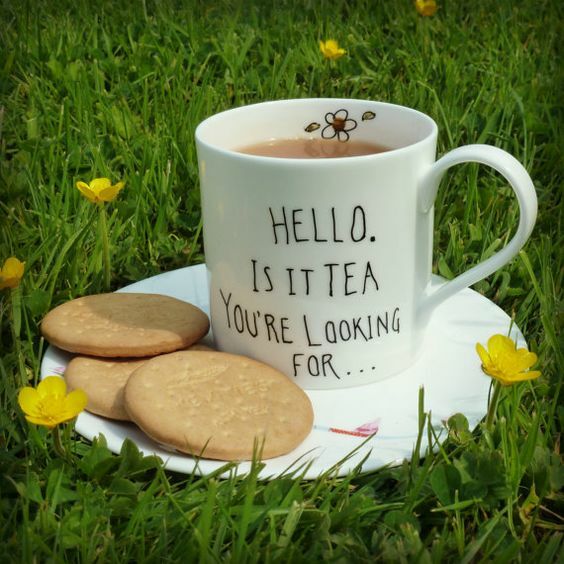 So settle in with a nice cuppa and ooh and ahh over some cute tea things! They have the loveliest tea choices at the hospital and I have tried every one of them. I hope you enjoy these! Pink and Green are two of my favorite colors together. Blame it on Lily Pulitzer. 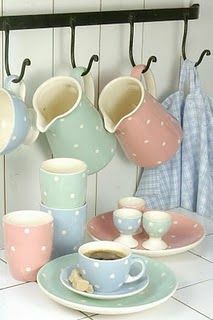 These are just all kinds of pretty! They are all so adorable! If you ever have too many, so what I did and turn them into grapevine wreaths!